I suppose I should start by saying that I didn’t really have any desire to see this movie. It just happens that it was all that was available on a Friday night after a long stressful week. I’ll follow that up by saying I’m glad I watched it. It was quite enjoyable in a number of ways. While I was never big on the story of Sleeping Beauty, that’s essentially what Maleficent is, but from a slightly different perspective. The movie looks visually stunning. The landscapes and imagery that were digitally crafted are beautiful. Sometimes more beautiful than you’d expect and the special effects teams are showing off a bit. For example, there’s a big battle scene near the beginning of the movie and part of that battle shows Maleficent (Angelina Jolie) flying around overhead and zipping around the enemy, mostly (I think) so they could show off the scenery around their created landscape. I didn’t mind much, though, because it truly is gorgeous and very well done. The story isn’t all that different from any classic Disney princess story we know from our childhood, though there is a slight twist at the end. It wasn’t quite a surprise and was fairly predictable as the film went on. It was, I will say, a welcome change to what was expected. It strays from the typical Disney princess stories of the past and tries something new that’s only been done in one other Disney film (very recently), if memory serves. 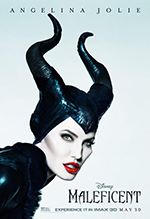 Angelina Jolie puts on an incredible performance as Maleficent, though you likely already know that. She embodies the character she plays, more so than she’s done in the past, and truly shines in the role. You both love her and hate her all at the same time, which is exactly what I think they’re going for. I didn’t care for Sharlto Copley — you remember him from District 9. He’s stale in his role and could have easily been replaced by any number of other actors who could have pulled off the small, but important, role much better. Elle Fanning is adorable, whimsical, and eager. Just as you’d expect Princess Aurora to be (yes, that’s Sleeping Beauty’s name). It seems where Dakota left off, Elle is picking up. Overall I really enjoyed the film. It wasn’t the greatest story in the world, but I didn’t care. I enjoyed it, its scenery, the dynamic between Maleficent and Diaval, and also Aurora. If you like classic Disney stories that have been updated for today’s day and age, this one’s for you.